A lot has happened in Minnesota after Thibodeau's dismissal, who will play with new coach and some changes to face the Thunders in an attractive game that will reveal some questions. 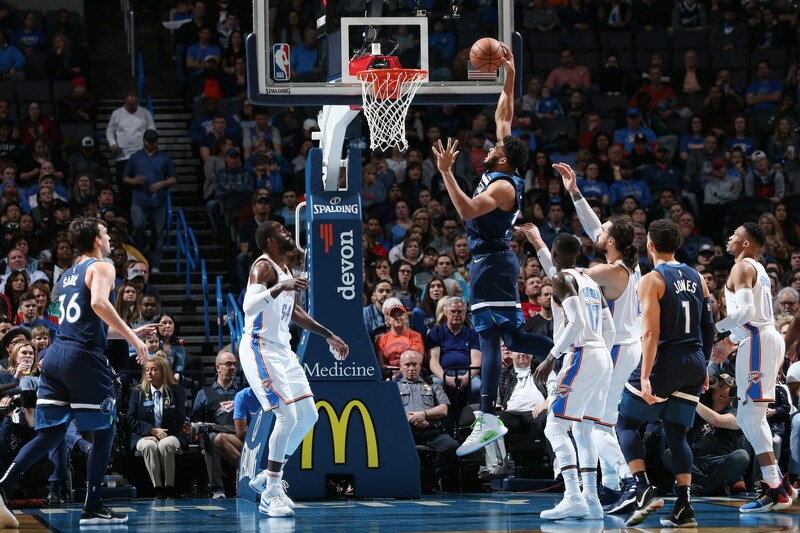 Wiggins scores a shot from midfield and opens the scoring in the match, Adams scores a hook, Teague assists Gibson, George takes an offensive rebound and converts the basket, Wiggins scores from midfield, Schroder scores an effective shot from the perimeter, Westbrook converts a tray into penetration, Saric basket near the basket and gets the foul, Adams turns on the paint and overturns, Saric basket from the 3-point line, finishes fourth 29 - 23 up Timberwolves. Towns overturns the ball in penetration, Diallo overturns the ball, Patterson basket an effective shot from the perimeter, Adams scores a mid-range hook, Okogie basket a tray in penetration, George basket an effective shot from the perimeter, Adams leaves a tray near the hoop, Adams assists Westbrook who basket a tray, Ferguson scores from the 3-point line, Wiggins scores an effective shot from the perimeter, Westbrook assists Ferguson who basket from the 3-point line, finishes the first quarter 64 - 64. Wiggins hits a mid-distance shot, Westbrook assists Adams who overturns it, George hits an effective shot from the perimeter, Westbrook assists Ferguson who scores from the 3-point line, Westbrook assists Noel with a great Alley-Oop, Westbrook leaves a tray in penetration, Saric basket an effective shot from the perimeter, Tolliver scores from the 3-point line, Westbrook basket a tray in penetration, Jones scores from the 3-point line, finishes the 3rd quarter 96 - 93 up Timberwolves. 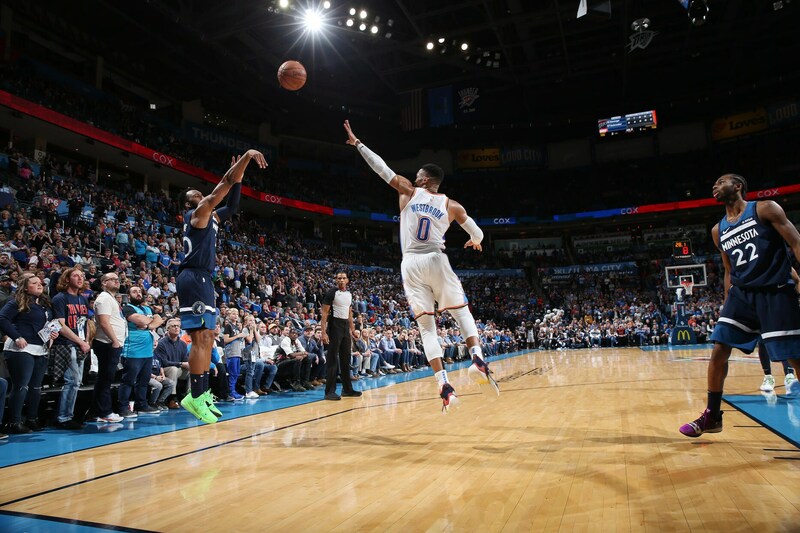 Tolliver hits an effective shot from the perimeter, Westbrook hits a tray in penetration, Westbrook assists Adams who overturns it, Westbrook again assists Adams and overturns it, Town hits an effective shot from the perimeter, George hits from the 3 point line, Westbrook baskets an effective shot from the perimeter and gives the advantage to Thunders, Wiggins baskets from half distance, Westbrook scores a shot from half distance, Wiggins assists Okogie who baskets an effective shot from the perimeter, ends the match 119 - 117 in a great victory of the Timberwolves over the Thunders. 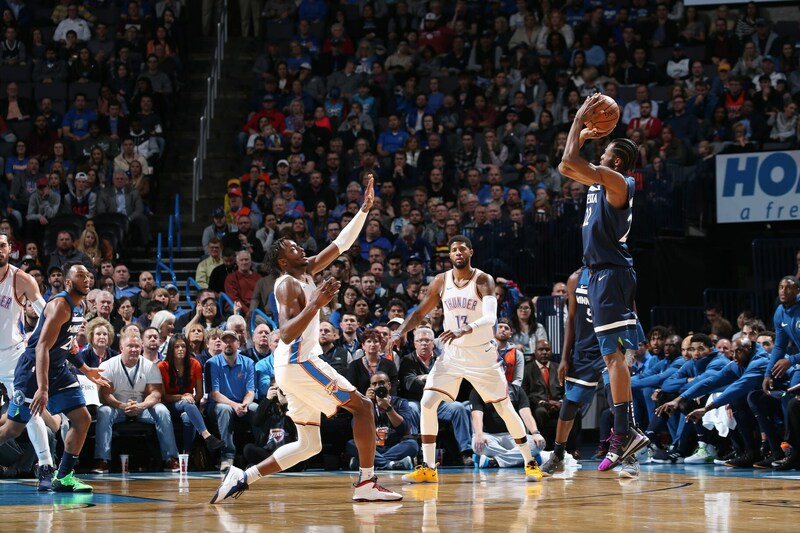 A match that was extremely closed from start to finish, but this time took a step forward the potential star player Andrew Wiggins to guide the Timberwolves to victory against Thunders, this time scoring the highest score so far this season for him, scoring more than 40 points and 10 rebounds, in a game where he looked excellent, having a great criterion and good percentage in his offensive performance, Towns also accompanied him who scored over 20 points, Oklahoma for his part did the same in a game where anyone could have won, but the great defense of Timberwolves in the closing of the last quarter gave him the final point for this excellent victory with new coach included. Andrew Wiggins 40 Pts. 10 Reb. Karl-Anthony Towns 20 Pts. 9 Reb.